Before 2.00, and between any of the coming major patches, there will also be minor steps. Egosoft tries to release bug fixes as fast as possible once they feel they are safe (which is why there will also be lots of public betas). Right now the public beta for 1.60 is available here. X4 patch 2.00 is planned for February 2019. 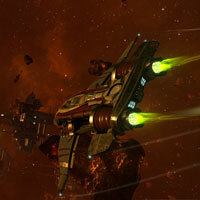 With 2.50 Egosoft aims to bring a new ship type: Resupply ships. In short, they will work like a flying equipment dock and can form the backbone of a large fleet. Linux version: The Linux beta is expected to start somewhere between 2.00 and 2.50 already but at the latest together with this update. TrackIR/Tobii support: While testing may start before it, Egosoft aims that 2.50 should bring support at the latest. Another thing planned for 2.50 is a series of improvements around managing inventory items. This includes the ability to create and drop crates in space and possibly also to store them on stations. As some of you may already have figured out, one cool feature of X4 is the ability to own entire sectors and even change their names. With 3.00 Egosoft aims to build upon this with a number of features to help you benefit from sector control. You can then basically become your own faction with your own set of rules. All updates should bring improvements/better missions. At the latest for 3.00 Egosoft plans to have a number of new and improved combat missions in particular. An area that’s planned to be combined with this is improved research (in the player HQ) and the ability to potentially even move the player HQ to a different location. With 3.00 at the latest, Egosoft plans to have at least one new gamestart. There is a chance that this will have some interesting new features. In December Egosoft released the very first online mode in an X game: Ventures. With the Updates 2.00 to 3.00 they will also continue work on more and better online ventures. So stay tuned for more exciting online missions. While all of the above (free) updates may also contain new assets, a lot of new ships, station modules, missions and new sectors will be bundled into the first big expansion. A rough timeline is to have an expansion based on introducing the Split race, their ships, a new Split economy and of course a large new area of space shortly after releasing 3.00. I cant wait!! Iam very very much enjoying this game!